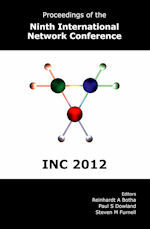 This book contains the proceedings of the Ninth International Network Conference (INC2012), which was held in Port Elizabeth, South Africa, in July 2012. A total of 20 papers were accepted for inclusion in the conference, and they are presented here in four themed chapters. The main topics of the book include: Network Technologies; Mobile and Wireless Networking; Security and Privacy; Applications and Impacts. The papers address state-of-the-art research and applications of network technology, arising from both the academic and industrial domains. These proceedings should consequently be of interest to network practitioners, researchers, academics, and technical managers involved in the design, development and use of network systems.